People sometimes easily send me their thoughts after reading our email versions of Integrity Moments. But it’s far more difficult for our radio listeners to respond. Therefore, sometimes it feels the radio version is less effective. Unless I have encounters like I did recently. 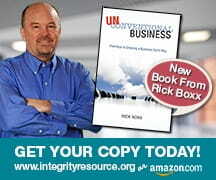 If you’re hearing this on the radio, email me your thoughts at rick@unconventionalbusiness.org.